These are so adorable. Thank you, I will have to try your technique. These are soo sweet! Thanks so much for the tutorial too!I might have to try this out! Thanks for sharing the tutorial for the sweet, little postcard! Beautiful. I want to make one. Thanks for sharing. I have never made a fabric post card - These are so sweet!! What a cute project, great for scraps! Those are so cute! My favorites are the owls and the improv LOVE. The hand stitching really adds detail to the heart! Very cute. I love them all. I had not heard of fabric postcards until reading your post the other day. Great idea to make V-day keepsakes Patty. How neat! I love mug rugs and one can never have too many! It’s been years since I made fabric postcards. Thanks for making them and such a sweet reminder that good things come in small packages. What a great idea. I have a young niece, and nephew who love to receive mail. I can't even begin to count how many times I've said I'm going to make a fabric postcard. These are definitely inspiring me to try...so cute! What a treasure for someone to receive one in the mail. Thanks for playing along with the hop! These are really cute. I have never made one and I would love to give it a try. Thank you for sharing and for the tutorial. I have never made a post card yet, but I have received them before, how fun! This is a great idea and something I think I'll try to do for my nieces if I can sneak them in! Great idea! I haven't tried making postcards yet but maybe it would be a way to use some of my scraps. Those are so pretty and would be fun to see popping up in mailboxes. Sew cute! Happy Valentine's Day! Thanks for sharing your post cards, Patty. Canadian Quilters association is doing a post card challenge as a fundraiser at their upcoming show in Vancouver BC, so I've been working on "nature themed" postcards. These little bits of art are fun to do. I love the postcards, Patty! I really need to make some of these. So cute! Thanks for sharing. What a fun, clever and gorgeous idea. What lucky recipients your Valentines are!! Thank you for showing us this wonderful idea. I certainly have a couple of friends who would cherish this sort of thing. You've definitely given me food-for-thought! Kudos to you. Love em...I used to be in a couple of online fabric post card swap groups. The post office got so stinky about what they would and wouldn't mail and the postage went thru the roof. So the groups just kind of fell apart. Too bad, because I had "sew" much fun with them. How cute. This idea is one I should do for the grands for V Day next year - I've already completed this year's cards. They would love them and the hand-written greeting is perfectly wonderful. Thanks for sharing. Happy Heart Day. Great idea — especially like the robot! I am very fortunate to have a small collection of fabric postcards. They are a joy to receive. So glad you shared this mini tutorial. It's all about sharing the love. Adorable! Each is special in it's own way. Love the heart and star postcards! Those are such fun postcards, so quick and clever! Thanks for the tutorial! So, so cute! I made fabric postcards a long time ago...you inspire me to get back into making them! These are too cute, thanks for sharing the tutorial! Such cute postcards. Thanks for sharing your ideas. So many cute Valentine postcards for your family!!! Want to adopt me???? Now I think I need to make some fabric postcards! These are so sweet and making them one-of-a-kind, they will always be treasured by the recipient. Thanks for the steps! I love these. I've seen some cute quilted postcards before, but yours are the best! So cute! I have never made a fabric postcard before. Thanks for sharing the tutorial. These are sew fun looking!! I can see why some people participate in the postcard swaps. I'm thinking I should make some for my grandkids for Valentine's Day. What a great way to brighten a young Valentine’s Day! The robot is perfect for boys, not sappy at all! I hope to remember this when my grandbabies are old enough to exchange Valentines! 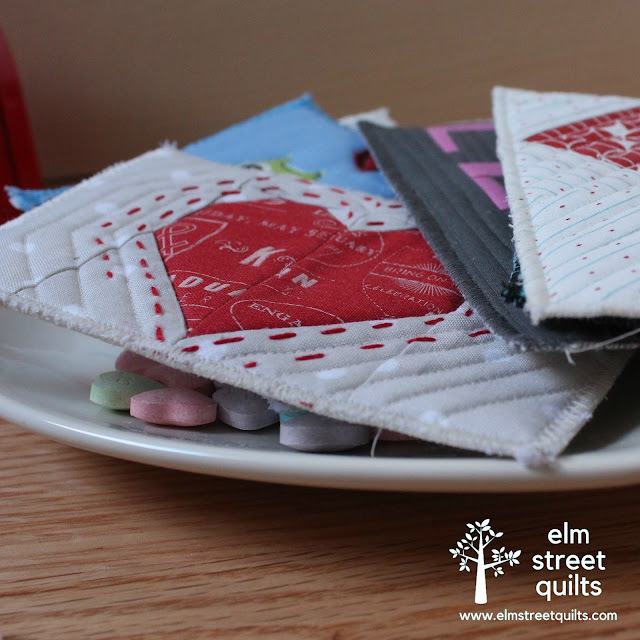 I really love the red heart with the chunky big stitch quilting. I would use that one myself as a mug rug! Thanks for the inspiriation! I haven't made Fabric postcards for years. Sew Cute!! Your post cards are adorable! I'm sure the recipients enjoy getting them. Thanks for sharing. Those are just the cutest! I need to make my kiddos one as well. The little red heart with the hand stitching around is so sweet. Thanks for the tut. These look like so much fun to make and receive! The robot! So cute. :) These are all really sweet. 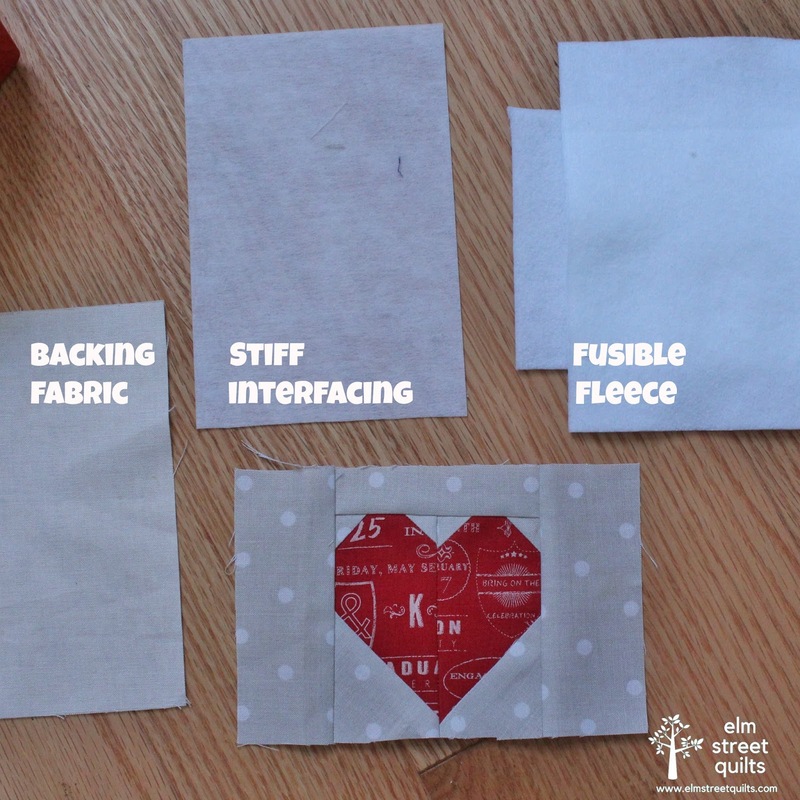 Thanks for detailing how you make your postcard quilts. Love all the postcards, such a cute and fun idea. Thank you for the tutorial on makng them also. I love fabric postcards. I like that you took the old fashioned kid's Valentine's Day cards and made them a bit modern. These are so cute! Love the robot! Thanks for the tutorial as well. I've made mine, although it is not Valentines. When are you sending the info for mailings? Ah, those cards. I love them all.